Do you like to have thick eyelashes but don’t have them naturally? If you answered yes, this post is for you! 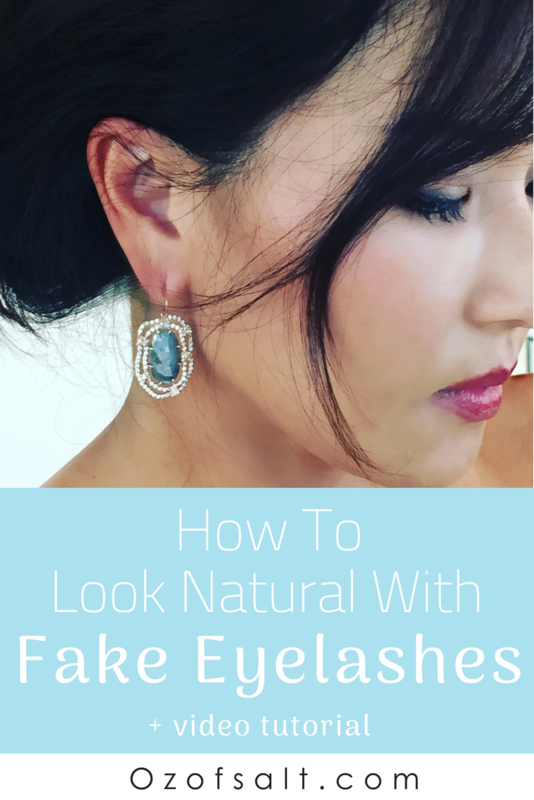 In this post, I will discuss how to achieve a natural look with false eyelashes. Eyelashes are the beauty vice I can’t live without! 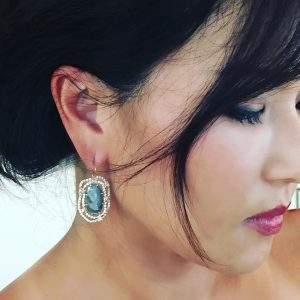 I’ve been getting lash extensions for many years (visit my post on extensions). It may be my imagination after having them for so long but, I feel I look much younger with lashes versus without. Even with no makeup on, if I have my lashes, I’m good! Did you know there is a surgery where you can get permanent lashes sewn onto your eyelids? 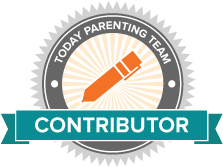 Eeek – I’m not that obsessive! But close. 2) Women who don’t want the hassle of wearing extensions but want to have dramatic lashes for social occasions. My skin care and lash regimen are important to me. I get lash extension refills with my facial every four weeks in Los Angeles. I like the natural look of lash extensions over wearing lash strips because 1) lash strips look unnatural 2) not having to worry about lashes saves getting ready time. There are occasions when I’ve been tough on my eyes or for whatever reason my lashes fall out earlier than my next appointment. Having patches of bald-lashes is not a good look! I searched for a solution to cover me during the in-between period until I could get back to Los Angeles for a refill. I’ve tried lash strips, individual lashes, flares and trio lashes. I’ve tried different types of glue (even the super-glue-like type made for professional individual lash application). 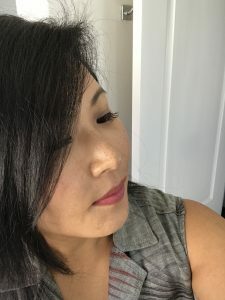 In experimenting with the various types of false lashes, the following are my findings to get the most natural look without damaging your existing lashes. Note: If you purchase via my links to Amazon, I may receive affiliate revenue. These are my go-to brand. They are my favorite in regards to the combination of price/quality/availability. The trick to having a natural look with false lashes is to mix the trio flares with the individuals at varying lengths (short/medium/long) with the longest being on the outer part of your eyelids. Because you put on one bunch at a time, there is more flexibility on how dramatic you can make your lashes. Once you get used to applying them, it will only take a few minutes to put them on. When you use the right tools to hold your lash and apply them, you will see how much easier it is to get the lash on the exact part of the eyelid you want. This glue is my favorite to hold lashes in place without damaging my existing lashes. I also like how it doesn’t get clumpy. It stays on well but with steam, removes easily. 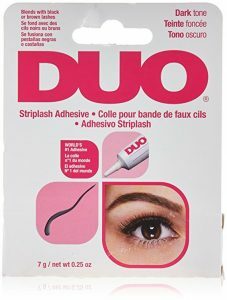 When you pick up the false lash, peel the existing glue off before applying the duo glue on the lash. The glue used to keep the lash on the tray is thick and artificial looking, so you want to avoid it on your eyes. The trick with the glue is to let it air dry for about 1-2 minutes before placing the lash on your lid. This air dry time allows the glue to become tacky and will lead to a more secure hold when you place the lash on your eye using the tweezers. Place the lash as close to the edge of your lids as possible. I even try to apply the pieces from under my existing lashes when I can. Depending on how thick your existing lashes are, this may or may not work for you. Try not to put the lash pieces exactly adjacent to one another, or they will look like strips. Natural lashes vary in lengths and spacing, so you’ll want to create the same look. Once the lash is on the eye, press your existing lashes with the false ones together, so the lashes are sticking together. This way, you have a secondary hold on the lashes in addition to the endpoint on the eyelid. So, what do you think? Was this post helpful for you? I feel like it is all simple information, but I’ve realized it’s probably only easy for me due to my obsession! Ha. I hope it helps you achieve gorgeous natural looking lashes.